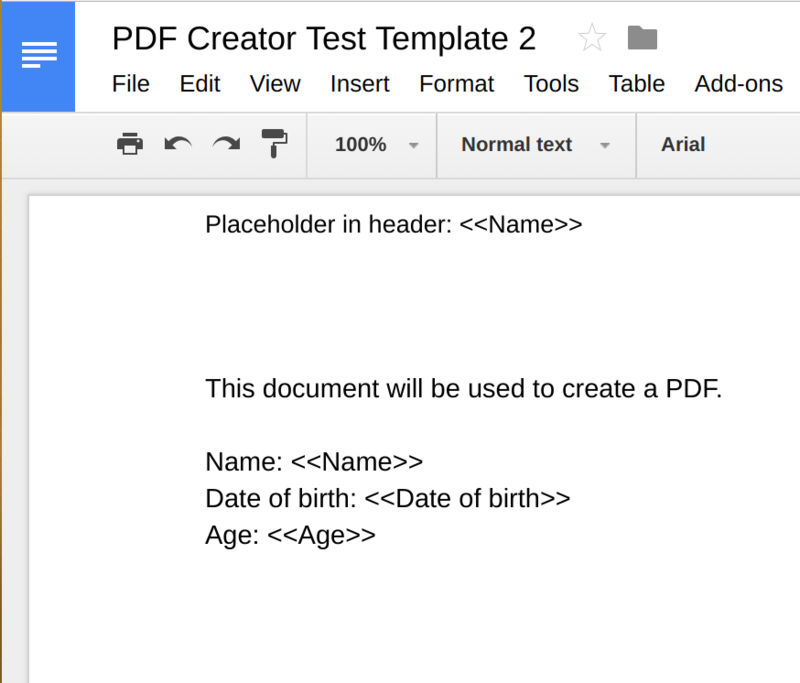 This script creates a number of PDF files using a Google Doc template and the rows selected in a Google Spreadsheet. Further to user requests, I have created many variations on the PDF creation theme. Get in touch now if you need any help with this or any other GAS scripts or have a look through some other free scripts and snippets. There is a Gist and a demo spreadsheet you can take a copy of to use and see the script. The script takes the fields from each of the selected rows in the GSheet “containing” the script and, using a Google Doc template (identified by TEMPLATE_ID), creates multiple PDFs. The fields replace the place-holders in the template. The place-holders are identified by having a << or >> either side, e.g. <<Name>>. It is invoked by the “Create PDFs” menu. If it finds a “Date Sent” column the script also records the date/time the PDF was sent. Create a Google Doc as a template using the place-holders with << and >> around the words, e.g. <<Name>>. Make a note of the ID number (https://docs.google.com/document/d/ID NUMBER HERE/edit). Like this for example. Create a new Google Spreadsheet and give it header names (first row) that match up with the placeholders minus the angle brackets, e.g. “Name” or “Age” (it is case-sensitive), and optionally one called “File Name” to specify the name of the PDF file created and “Email” to specify who the PDF should be emailed to. Copy the script into Code.gs in the script editor (Tools > Script editor), paste the template ID number into TEMPLATE_ID value (between the ”s) and add a file name for the new PDF in PDF_FILE_NAME if you don’t want to use the template name. Update the GSheet. Put the actual values you want to use in the spreadsheet under the appropriate columns, one row for each PDF file. This could be the responses from a Google Form. Select the rows that you want to create and send PDFs from. Click the custom menu “Create PDFs > Create PDFs for selected rows” in the GSheet. Lets assume each cell in the Age Column in the google spreadsheet contains a comma delimited value. Say the Age cell in the 1st row contains; 1, 2, 3, 4, 5 and I wish to be displayed as a new line for each in number in the PDF. How will the place-holders with <> be in the Google Doc Template file? If you have a fixed number of CSV values you could use a split() in the code and update it to write to a fixed placeholder for each in the GDoc. Otherwise you’ll have to use the DocumentApp to append the values to the GDoc. Is it possible to pull the EMAIL_SUBJECT and EMAIL_BODY from the Google Spreadsheet, so that each sent email can have a unique subject and body? I would like to create “Email Subject” and “Email Body” as column headers in my spreadsheet to pull from. Then same thing for EMAIL_BODY. You can also do the same search and replace for placeholders in these too. Hi Andrew, thanks for the script! I’ve followed your instructions and seem to have encountered a permissions error…basically, every time I try to run the script it asks me to choose a domain from which to access the template, then it says that the app isn’t verified by Google. What’s strange is that Google claims that “Review is not required for Apps Script projects whose owner and users belong to the same G Suite domain or customer.” Have you run into this issue before? Please advise – thanks. Hi, I’ve not seen this before, but my best guess would be you could be logged into multiple accounts – that causes some strange behaviour sometimes?? Could you be logged into a consumer Google account at the same time? Could you explain what you mean by “consumer Google account?” Is there another type of Google account besides the “consumer Google account?” Thanks so much! A consumer account is the free one you get when you sign up for GMail. Drop me a line if you work out what the domain issue is. I made an entirely new project, with the associated files on one account and it worked! I was wondering however if you could adapt this script to send multiple pdfs based on selected columns rather than rows…would you just switch the instances of getColumns with getRows and vice-versa? Hi. Not sure how that would work. A row describes a particular set of data, and a column the fields in that data. Why would you select a whole column? Hi! That’s a very interesting script! Thanks for sharing it! Do you know how it should be tweaked in order to make it send all pdfs attached on one single email? Is it possible? The simplest way would be to put the same email address in each row, otherwise you’d need to hard-code the email address and stop the code looking for it. Hi Andrew, can i save the generated pdfs file into specified destination? Hi Andrew, this script is amazing. Just wondering how I would go about logging the link to the PDF created (with the information from the row) in the first column of the sheet? Hi, Glad you are finding it useful. You can use getUrl() and then look at SpreadsheetApp for how to write to a spreadsheet. Hi tab. did you get the code to do it ? I think the code is great, thank you very much for sharing it. I need something very similar but the template should be a document spreadsheet because there are several values that are dependent including images of bar codes. I am kindly asking you if you can help me? another thing would be better instead of selecting the row, marking it with a check box in the first column. The technique for completing a spreadsheet template would require a list of placeholders and the cells the values would be written into. The code could also be customised to use a checkbox. Drop me a line if you would like me to employ me to develop a custom solution for you. Hi Andrew, your script has been tremendously helpful to me. Thanks so much for sharing. thousands = 123, units = 456, and hundredths = 78 hundredths. Obviously still a bit of a challenge there for you to separate out the original number, but you’ll probably find plenty on Stack Overflow. If you do come up with code, do post it back on my website.